Tubbygaijin.com » Announcing the launch of Gundamfactory.com! Announcing the launch of Gundamfactory.com! I’ve been a bit quiet on the posting front recently, while working on a secret project which i’m now proud to unveil! 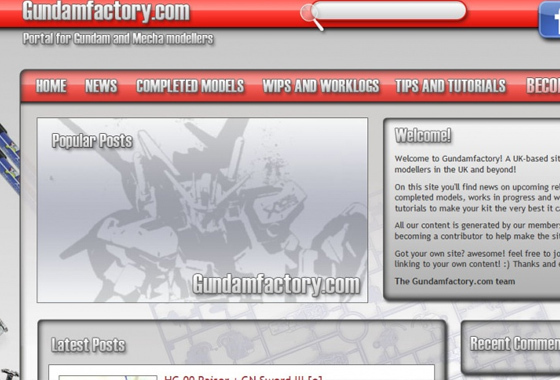 I’ve created Gundamfactory.com to try and give Gundam and mecha builders a community, a place to share your work and look for tips or inspiration. I’m not trying to redirect attention from anybodys personal site or blog, I’d be more than happy if you joined up and created summary posts linking back to yourself. 9 Responses to Announcing the launch of Gundamfactory.com! yah , sign me up! i’d long thought of doing the same thing, and maybe a forum as well but cant afford the web space at the mo! however, i’d be proud to contribute and have signed up. gundam uk here we come!!!!! Great to have you on board 🙂 I can’t really afford either hence the google ads, which will fingers crossed cover a bit, and i’m hoping if it does get busy this will also fund giveaways! Cheers Gaz! did you get my email btw? Looking forward to following your Japan adventure! I did get your email, cheers for that – all very useful. I will get around to responding in the next day or so..I finally ordered a HGUC FA-78-3 Full Armor 7th (1/144) – It’ll take some time to get over from Japan but we’ll see how I get on with that. Ah no probs! Just checking as my webmail can be a bit flaky sometimes 🙂 Congrats on your first Gunpla purchase, 7th is a beast of a unit I look forward to seeing it!